We’d love your help. 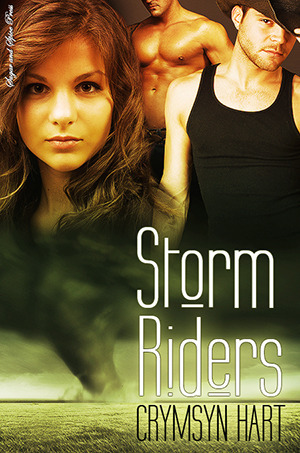 Let us know what’s wrong with this preview of Storm Riders by Crymsyn Hart. George has been searching for a way to predict tornadoes that mimics her inherent ability. Her encounter with a handsome cowboy that drives away a twister has her stumped. Wyatt and Landon are Storm Riders assigned to wrangle cyclones. When they both meet George, they’re driven to possess her even offering themselves to her for a wild, stormy night of passion. When their bo George has been searching for a way to predict tornadoes that mimics her inherent ability. Her encounter with a handsome cowboy that drives away a twister has her stumped. Wyatt and Landon are Storm Riders assigned to wrangle cyclones. When they both meet George, they’re driven to possess her even offering themselves to her for a wild, stormy night of passion. When their boss, Raul gets wind of this, he demands they cease all contact. Neither Wyatt nor Landon can stand to think she won’t be part of their lives. She’s turned their worlds upside down and each craves George’s touch. To ask other readers questions about Storm Riders, please sign up. George was saved by from the same tornado that took her father by a mysterious cowboy, who she is convinced was the creation of a child's traumatized mind. Since that storm, George has had an affinity for tornadoes that lead to her work as a very specialized meteorologist. Wyatt and Landon are a very special type of wranglers. They are Storm Riders, humans granted immortality by angels to ride the earth's storms and keep nature in balance. Very unique take on the paranormal genre. It held my i George was saved by from the same tornado that took her father by a mysterious cowboy, who she is convinced was the creation of a child's traumatized mind. Since that storm, George has had an affinity for tornadoes that lead to her work as a very specialized meteorologist. Wyatt and Landon are a very special type of wranglers. They are Storm Riders, humans granted immortality by angels to ride the earth's storms and keep nature in balance. What a great start to a series. I couldn’t turn the pages fast enough, such a great fast and short 101 page read. The two Storm Riders in this story make me want to ride a cowboy and explode like a raging tornado. I loved the chemistry between the three characters Georgiana (human/new storm rider), Landon (Storm Rider), and Wyatt (Storm Rider) – It was electrifying! I also loved the elemental horses used by the Storm Riders, they had such great characteristic persona Totally Awesome! HOT Erotica! What a great start to a series. I couldn’t turn the pages fast enough, such a great fast and short 101 page read. The two Storm Riders in this story make me want to ride a cowboy and explode like a raging tornado. I loved the chemistry between the three characters Georgiana (human/new storm rider), Landon (Storm Rider), and Wyatt (Storm Rider) – It was electrifying! I also loved the elemental horses used by the Storm Riders, they had such great characteristic personalities. To top it off, the horse George is gifted with has a fabulous name “Hurricane”. It brings to mind a song called “Rock you like a Hurricane” by Scorpions. Not only does Hurricane the horse rock but Georgiana rocks both Landon and Wyatt’s World. I can’t wait to dive into the 2nd book in the series “Smoke Jumpers”. 3.5 rounded up to 4. I wish it were a little longer, but there are more books that come after this one so I hope this couple is part of them. Not my favorite..... left much to be desired.... non conclusive ending.